ONTRAPORT's unique integration with Facebook Custom Audiences is included in ONTRAPORT Plus and above accounts. It enables the use of Campaigns, Group Actions and Rules to automate the process of adding Contacts to Facebook Custom Audiences. Note: Certified Consultants and Virtual Assistants: This integration should be built ONLY by using your client's Facebook account. If you connect with Facebook for two or more clients using your Facebook account then all of the clients will see all Custom Audiences in your Ad or Business Manager account from within ONTRAPORT. 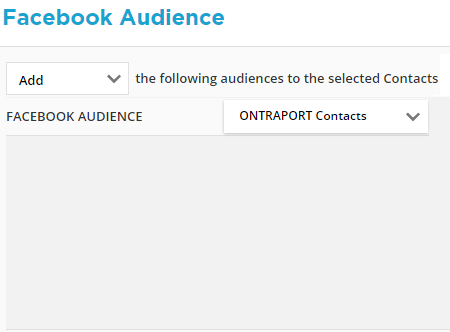 To convert your existing "Facebook App" integration for Custom Audiences simply follow the steps in the Connect ONTRAPORT to Facebook section below and ONTRAPORT will take care of all the details. An ONTRAPORT Plus or above account. If you haven't done this already, create a Facebook Ads Manager or Business Manager account. 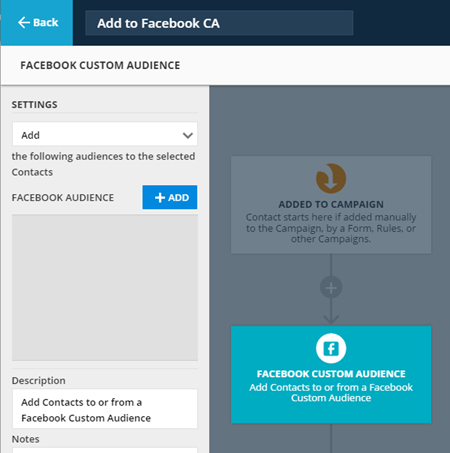 Create Facebook Custom Audiences in the ads accounts set up in step 1 if you don't already have them. Create a Custom Audience using the "from a customer file" option. Upload a CSV file made from an export of at least 25 valid Contacts in your ONTRAPORT account. The only fields you need are First Name, Last Name and Email address. See Exporting Contacts for information on how to do this in ONTRAPORT. Wait until Facebook has approved your Custom Audience to continue. Click your profile icon at the top right of your ONTRAPORT account and select Administration. Click the Social section and select the Facebook API link. The Facebook icon will appear in the Contacts Action Bar when you select contacts. Clicking the button will show you all the Custom Audiences that Facebook has approved in your ads or business manager account. In the Contacts database, select the contacts to add to the Facebook Custom Audience. The Actions drawer will display. Click the Facebook button. Select to Add the selected contacts the Custom Audience. In the Settings for the element leave the first drop down on the default Add to add Contacts to one or more Custom Audiences. Select Remove to remove them. Click the + Add button above the Facebook Audience box and select the Custom Audience to add the contacts to. You can select more than one. Add an End element under the Custom Audience element to complete the Campaign Map. You can add Contacts to the Campaign via a Group Action, selecting Add to Campaign. Add a Trigger for a Tag you add when someone wants all data removed. In the Campaign you can delete them from all Custom Audiences and then Tag them for final deletion of their Contact Record. Search for "ONTRAPORT" on the Applications tab. Click the check box for the ONTRAPORT App and click Remove. A confirmation dialog will pop up. Click to confirm removing the app. 5. You have completed removing the ONTRAPORT App from your account. 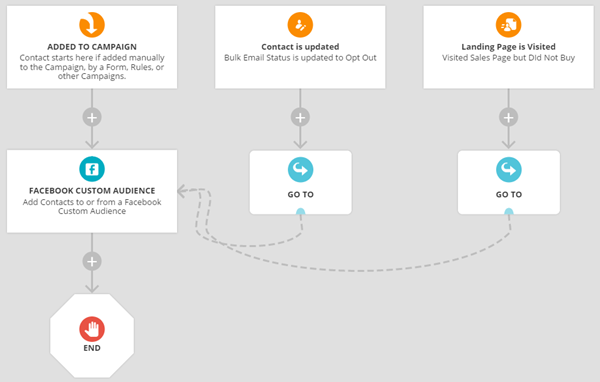 To reconnect ONTRAPORT to Facebook Custom Audiences, repeat the steps in Connect ONTRAPORT to Facebook above. On July 2, 2018 Facebook made an update that requires users of Custom Audiences to Accept TOS (Terms of Service). Until the user agrees to Facebook Terms of Services, any Custom Audience Triggers connected to ONTRAPORT will fail. Follow the steps below to agree to Facebook Terms of Service and reconnect to ONTRAPORT. Click Manage Ads in the upper right hand corner. Under the Assets column, click Audiences. Locate the Custom Audiences you use with ONTRAPORT that have an Accept TOS button under the availability column. Click the "I Accept" button and agree to the terms. Confirm the Availability for that Audience is "ready" (a green light appears next to it). Log into your ONTRAPORT account. Click your profile icon at the top right of your ONTRAPORT account and select Administration. Click the Social tab and select the Facebook API link. Q. I have an old "Facebook App" integration. How do I upgrade it? A. Simply follow the directions found in Connect ONTRAPORT to Facebook to convert your stand-alone Facebook App integration to the new method! ONTRAPORT will take care of all the other details in the background. Q. What about security? Does Facebook use the emails we give them for their own marketing? A. According to Facebook, the email addresses are encrypted and only a "hash" is used to make the matches. When you submit a new Contact, Facebook hashes that email address and then looks for a match. Q. What about GDPR disclosure requirements? Q. I don't want to give Facebook my credit card. Can I still do this? A. Facebook Custom Audiences are for advertising, so their rules regarding account set up must be followed. They will allow you to set up and verify your account, but before you can start advertising you will have to provide a payment method. Q. Does this give Facebook access to my ONTRAPORT account? A. No, there is no data transferred to Facebook that you do not authorize using a Campaign, Group Action or using a Rule. Facebook has no access to your Contacts, sales data, or any other part of ONTRAPORT in any way. Q. I manage multiple Facebook accounts. Will this work with Facebook Business Manager accounts? A. 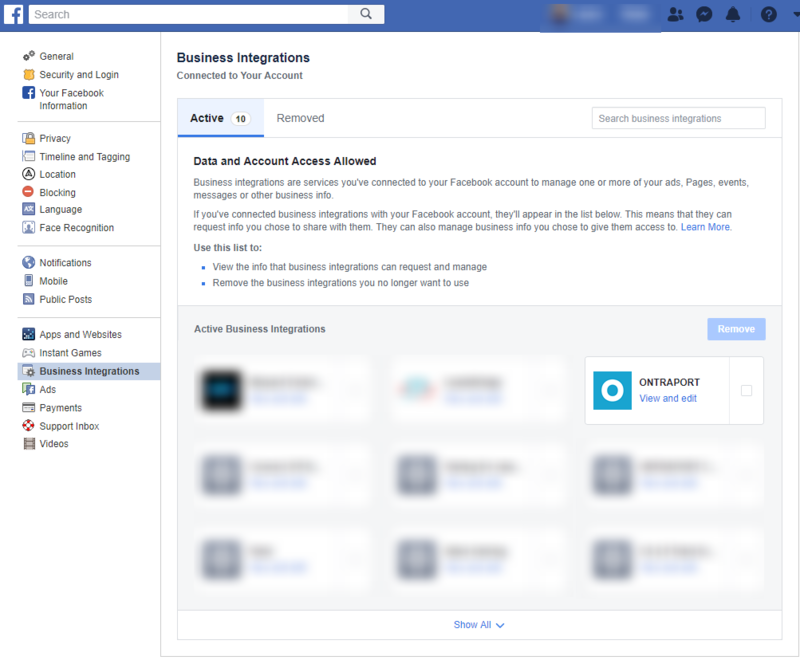 Yes, this integration will work with Facebook Business Manager accounts. Q. My ads accounts display in a weird order in ONTRAPORT. Can I sort them? A. ONTRAPORT cannot control the order in which Facebook returns the ads accounts. Q. One of my ads accounts that has no Custom Audiences in it is showing up in ONTRAPORT. Why? A. When we request the list of ads accounts from Facebook, they return all ads accounts you administer to the list of Approved Ad Accounts API. Even if the ads account has no lists, it is still a valid ads account and will show blank in OP. Q. Not all of my Custom Audiences are showing up in ONTRAPORT! Why? A. We only list Custom Audiences that we can add Contacts to, so Look-Alike and Saved Custom Audience types might not be visible. If one Custom Audience does not display in ONTRAPORT, but others do, it is because we cannot add or remove Contacts from that Custom Audience. Q. That was easy. Why do people think adding Custom Audiences is hard? A. In late February 2018, ONTRAPORT improved the process to connect to Facebook and simplified the method. New Facebook Custom Audience integration will be active as of 4 PM Pacific time on Mar 6, 2018. All existing comments on this article have been removed for clarity.